Last weekend Hong Kong opened its doors to more than 130 elite athletes from 24 countries. Two-day aquathlon and triathlon competitions were held here. On the first day, the Aquathlon Asian Championship was held, in which 29 athletes from elite, junior, and U23 categories took part. The athletes overcame the distance, which consisted of running for 2.5 km, swimming for 1000 m and another run lap for 2.5 km. Kazakhstanis, who started on this day, were able to first win this distance and crown the podium. So, an athlete from the Almaty region Daryn Konysbayev won the gold medal in Junior and "bronze" in Elite for 34 minutes and 25 seconds. 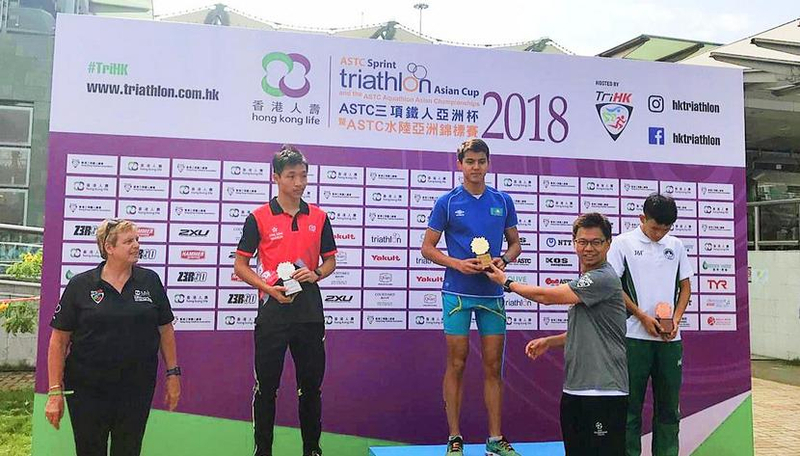 Another Kazakhstan member of the national triathlon team Semyon Pivovarov (Shymkent) took the third place in the U23 category for the result 34 minutes and 52 seconds. The second day in Hong Kong was not as “fruitful” on the medals as the previous one. On this day, there was continental Asian Triathlon Cup, in which 108 elite athletes participated. Among Kazakhstani sportsmen who passed the sprint distance, Semyon Pivovarov (Shymkent) showed the best result. His result is 01 hour 01 minute and 40 seconds, 16th position in the final protocol. And Daryn Konysbayev (Almaty region) finished in 30th position with a result of 01 hours 03 minutes and 43 seconds. Alexander Avtushko (Shymkent) was placed on the 33rd line with a score of 1 hour 05 minutes and 08 seconds. Another athlete from Shymkent, Sabyrzhan Kossak, finished in 40th position and showed a result of 01 hours 08 minutes and 04 seconds. The first place in this category was taken by Japanese Takanori Sagihara for the result of 59 minutes and 06 seconds. Second place went to Hong Kong athlete Cheung Sing Nicholas Tsang for the result of 59 minutes and 27 seconds. The top three winners were locked by Chi Zhang, an athlete from China, with a score of 59 minutes and 31 seconds. Well, among the women who performed in Hong Kong, there were two athletes from Kazakhstan. Arina Shulgina (Astana) finished in 12th position with result 01 hour 05 minutes and 54 seconds. Anastasia Avtushko (Shymkent) finished at the 37th position with a time 1 hour 23 minutes and 37 seconds. Hungarian Zsófia Kovács won the gold medal for the result of 1 hour 02 minutes and 52 seconds. The second place was taken by Joanne Miller with the result of 01 hours 03 minutes and 18 seconds. Bronze won Alberte Kjær Pedersen for the result of 1 hour 03 minutes and 26 seconds.